St. Aidan was an Irish monk from the monastic island of Iona. The saint lived in the days when Christianity was just beginning to take root in England, and missionary work met severe resistance from pagans. Northumbria was among the lands where the Gospel was unknown to most people. The entire kingdom had only one church, in the town of York. The newly converted king Oswald asked the monks of Iona for missionary help. The monastery sent brother Corman, who, after trying to evangelize the Northumbrians for some time, had to return and report to the brethren that he did not succeed: the people were too hard-hearted to accept the Scriptures. As the monks were thinking what to do next, Aidan spoke. “Brother, it seems to me that you were too stern with your listeners. You should have followed the practice of the Apostles and begun by giving them the simpler teaching and gradually instructed them in the Word of God until they were capable of greater perfection.” The brethren saw that Aidan was a true pastor, suited for the difficult mission. Accompanied by several monks, St. Aidan started his trip to Northumbria. A humble and compassionate person, the saint missionary quickly gained the respect of the natives. He talked to the people as a friend, and often travelled many miles on foot to meet them in their homes. If someone gave him money, St. Aidan spent very little on himself, only enough to buy simple food. He gave away the rest to the poor or used it to free slaves. Under the protection of King Oswald, Christianity flourished in Northumbria. The king granted St. Aidan the island of Lindisfarne, where a monastery was built. The monks of Lindisfarne, following their bishop’s example, did not seek worldly possessions. They led a holy life of prayer, fasting and hard work. Bishop Aidan founded a school for monastic missionaries. There, English boys were trained to preach the Gospel. Several miracles of St. Aidan have been recorded. Once, he stopped the siege of Bamburgh, the royal city. The enemy set fire to wood piled against the city walls. But the prayers of St. Aidan changed the direction of the wind, and the flames made the invaders retreat. Another time, he saved some sailors by calming a storm at sea. After St. King Oswald died in a battle, Bishop Aidan grieved the loss greatly. King Oswald’s successor, Oswin, was a pious man and also became Aidan’s beloved friend. One day, during a meal with King Oswin, St. Aidan started crying quietly and said something in Irish, which the others could not understand. When someone asked him why he wept, Aidan answered, “Very soon, the king will be taken from us. We do not deserve such a noble king.” His words were prophetic. St. King Oswin died a martyr’s death, betrayed by a man whom he trusted. 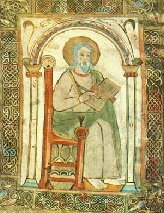 St. Wonderworker Aidan lived only a few days after the murder of the king. On August 31, 651, he died from grief. The saint’s body was buried in the cemetery of the monks at Lindisfarne.